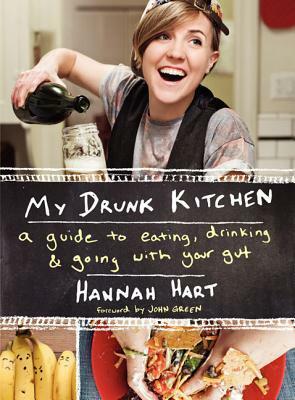 Fans of Hannah Hart's YouTube series My Drunk Kitchen will be further smitten with this "cookbook" of the same name. If you've never seen My Drunk Kitchen before, do yourself a favor and go watch an episode. I guarantee you'll find yourself watching about 5 or 6 instead of just one. Here, I'll help you get started with this epic episode where Hannah cooks with Jamie Oliver. Basically, Hannah Hart parodies the genre of the cooking show with both humor and grace, and that is what you will also find in her "cookbook" as well. I keep using the word cookbook in quotes because, let's be honest here, this isn't really a cookbook. No one is going to buy this to try to make anything therein, and yet, Hart has mastered the art of cookbookery without actually having written a serious cookbook. But despite the humorous, fun parody of the cookbook genre, the book has an underlying depth and heart to it once you root through all the puns and silly humor. ...this is the wonder that is Hart's drunk kitchen: Whether you are deep in sadness or the happiest you've ever been, Hannah Hart knows how to make it better. She makes you feel less alone in the dark night of the soul, and even more joyful in the good times. WARNING: Cooking in an oven, on a stove top, or on any heated surface (including city sidewalks in summertime) should only be attempted while accompanied by an adult. And by "adult" I mean someone who isn't drunk. It can be your kid sister too. She seems pretty responsible for a sixteen-year-old. I mean, she's always reading those YA books, so she must have learned a thing or two about life. PRO TIP: It's always good to be eating while you're making something to eat so that way you don't eat it all if you're supposed to be sharing. LIFE LESSON: You might not at the standard of living that you aspire to achieve. But be patient. And sometimes eat some comfort food that you've sliced into a sushi shape. I have very mixed feelings about Hannah and her drunk kitchen. The cookbook is fun, but, as you say, you're not really going to cook from it. I'm intrigued by this though I think it's probably something I will get from the library but now I want to go watch a few of her videos! I got this from the library but it didn't really grab me. Cheers from Carole's Chatter! I watched a video but it wasn't for me; it's more for the "young people".